Ricky D'Ambrise, who wrote and directed this short feature, is evidently part of a little group of young people in Brooklyn involved in making literate, talky, low-keyed films which flirt with themes of mystery and the occult. We note the common thread among others of Bingham Bryant, who co-directed For the Plasma a couple of years ago and plays the young man, David, who disappears in this one. Bryant also produced a 2016 film about two Argentinians in New York called Dear Renzo. There are links with Alex Ross Perry, and the credits cite a number of New York film critics, as well as Film Society of Lincoln Center programmer Dennis Lim, who chose the present film for inclusion in the New Directors series that gives it its US and New York debut. New York movie writer Glenn Kenny plays a minor role as a morgue assistant. 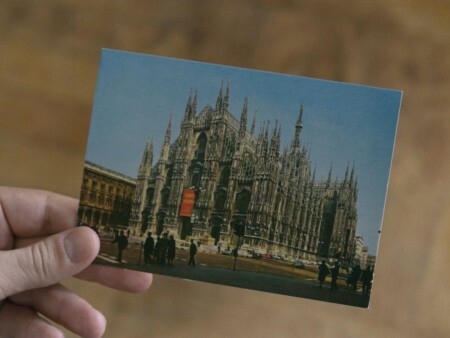 Notes on an Appearance is more about the disappearance of a young unemployed man from Chappaqua, NY, called David (Bryant), who at one point was in Milan and sent some postcards from there. There is some old footage. There are many shots of tables with snacks or breakfast. Given that this is a film by and about young people, and caffeine has never been in higher regard with this demographic, coffee is a constant item in these shots. There are also shots of diary entries by David, as well as his cards, and rather arcane references to a controversial political theorist called Stephen Taubes, an elaborate creation of this film, whom David has been hired to gather research on for a biography of Taubes by David's friend Todd (Keith Poulson), who has a fellowship that allows him to work on it full time. Taubes is made to seem more real than David, with severalTimes news articles about him shown, a photograph, and an obituary, and even an article about him by Louis Menand in The New Yorker. And there is a dryly staged meeting of three young literary critics before a small audience. D'Ambrose likes to create or recreate his world at one remove. Taubes' reputation and influence after his demise is nearly as important as the physical disappearance of David. The invented documents are "paper" rather than electronic, ostensibly because one of the characters most concerned by the disappearance is a doctoral candidate who's an archivist, gathering material for somebody else who is writing a biography of Taubes. But it's also true that "paper documents" probably have a quaint and appealing historical flavor for twenty-somethings weary of their own tiresome Internet- and device-driven generation. D'Ambrose recognizes there's something more genteel and pleasant, perhaps, about a world free of smartphones and such, even though this film's world is the present. The characters speak in little scenes of dialogue shot up close with blank backgrounds. The action is seen as being an arcane "search" for the missing David, but the process lacks urgency, and the solution to the mystery doesn't come through the young clique's efforts. This is a "minimalist" film, its spare style making a virtue of the necessity of a very low budget. It's an exercise in style, with something a little European about it, a hint of W. G. Sebald, perhaps; something intellectual, something that avoids the visceral or genre or emotional, with its dry invented worlds of a vanished young man and invented public figure. There is a delicate aesthetic, with the academy ratio images in pale colors and a little fuzzy at times. Greg Cwik of Slant notes that the film falters when it comes to the disapparance of David. Despite the occasional use of a haunting, broody soundtrack, D'Ambrose's approach is too meditative and too far from basic genre techniques to generate tension. What he's best at (as Cwik says) is playing thoughtfully, unhurriedly, with locations and objects. Sometimes, though, this film seems to be grasping for an elegance and complexity of style D'Ambrose, despite reportedly some very interesting shorts under his belt, still lacks the means or the chops to achieve. Notes on an Appearance is valuable for what it seeks to be rather than for what it is. Notes on an Appearance, 60 mins., showed in the Forum section at Berlin Feb. 2018 and also in the Spirit of Fire Film Festival in Russia. It was screened for this review as part of the MoMA-Film Society of Lincoln Center 2018 New Directors/New Films series, its North American premiere.